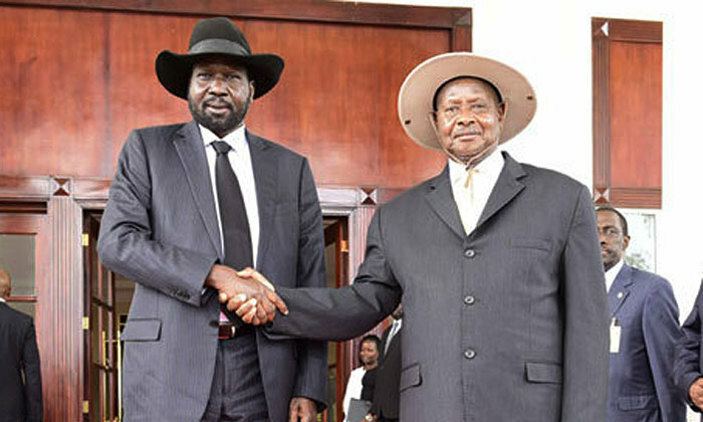 SUDAN-In a closed-door meeting held on Monday with Presidents Omer al-Bashir of Sudan and Yoweri Museveni, South Sudan rival leaders President Salva Kiir and SPLM-Io leader Riek Machar agreed to make the needed concession for the sake of peace in the war-ravaged country. As a result, the rivals will today Wednesday June 27 sign a framework agreement in the Sudan capital Khartoum, as they wait for a detailed deal to be signed at the end of the talks in two weeks’ time. According to sources close to the process, discussions which precede the signing today will focus on three issues including a comprehensive ceasefire and the deployment of IGAD and African Union monitors, having three capital cities in the country during the transitional period (Juba- Malakal-Wau). And the third provides that Sudan in coordination with South Sudan would take in charge security and repair of oil wells in South Sudan. The Sudanese foreign minister al-Dirdeiry Ahmed said the parties have reached an agreement dubbed “Khartoum Political Declaration” that will be announced Wednesday. 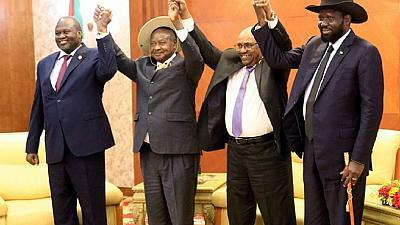 For his part, Machar said that Khartoum Political Declaration is based on the principles agreed in the meeting with President Museveni, President Kiir and President al-Bashir. Meanwhile Sudanese President Omer al-Bashir announced the opening of the border with South Sudan saying it would facilitate the movement of citizens and the flow of trade between the two countries. He further stressed Sudan’s will to provide anything that contributes to the achievement of peace in South Sudan. “If peace is achieved during the two weeks, you will find us everywhere with you in support of the South Sudanese citizens,” he said. President Kiir said he looks forward to reaching a peace deal to end the suffering of the South Sudanese people. He further praised the efforts of President Al-Bashir to end the four and half year conflict in South Sudan.